Review: In their much celebrated history, PIXAR animation has taken audiences on spectacular journeys. Whether you were under the sea Finding Nemo, flying high with Up, racing along with Cars, seeking adventure in your Toy Story, or speeding through outer space with WALL*E the creative minds at the studio have always been found inspiration in the present or future. With Brave, PIXAR has stepped up to face their critics and produced their first period piece with their first female protagonist. As is typical with PIXAR, the resulting film is a layered, thoughtful, winning piece that explores parental relationships and a child’s need to discover true independence. Gloriously set in the Scottish highlands in medieval times, the film has a prologue that introduces princess Merida (voiced by true Scot MacDonald who replaced, of all people, Reese Witherspoon) and her royal parents (Thompson and Connolly) as they celebrate Merida’s birthday. The appearance of ghostlike fairies and one mean bear set the stage for a passage of time which brings us to a teenage Merida who is all tomboy rougness. Favoring archery to needlepoint and outdoor adventures to drawing room discourse, Merida is a handful for her arch mother that believes a princess should act in certain ways. Like most teenagers, Merida has a rebellious side that is drawn out in full force when her parents organize a competition for Merdia’s hand in marriage. The politics of this marriage were an interesting wrinkle to the film. Sure, animated film have featured betrothed brides before but in Brave the reasons behind the necessity of marriage to ensure unity among clans is spoken of on a level that is easy to discuss with children. It’s not that Merida doesn’t have time for boys; it’s just not even on her radar of interest yet. 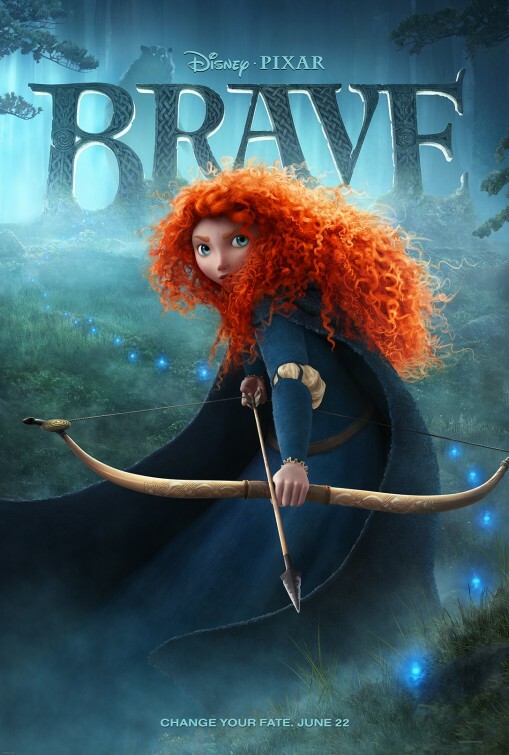 The trailers have done a good job concealing the second and third acts of Brave so I won’t spoil it for you except to say that when Merida seeks a chance to change her fate (with a few nods to The Little Mermaid) she’s faced with confronting the consequences in a uniquely PIXAR/Disney way. What PIXAR does so well is to create characters that feel like they could be flesh and blood were it not for their computer animated skeletons. From Merida’s exquisitely detailed curly red hair to the distinct differences between the clans coming to win her hand, life has once again been breathed into stock characters…giving us a feeling of reality in this animated world. I appreciated that save for the aforementioned mean ‘ole bear there is no real “villain” in the film thwarting our heroine. The journey isn’t about conquering an outside force but accepting some shortcomings that exist within all of us. In defeating our inner demons, we learn and become better. There is also a strong focus on familial relationships…especially mother/daughter ones. Don’t let that fool you to thinking that men can’t learn a little something from this as well. Ultimately it’s about the support we find in our family and the solace that that support can bring. Is Brave a home-run on par with the Toy Story trilogy, Up, or Wall*E? I don’t think so – although I did like it better than both Cars films and A Bugs Life. It has some pacing problems and is scarier than it probably should be considering its audience. I think it sits right in the middle favoring the good side more than anything. The animation is spectacular (the 3D is nicely immersive should you go that route), the music intoxicating, and it carries a story with it that is moving and timeless. It’s tradition for PIXAR to release their full length features with a short and the Oscar nominated La Luna was featured before Brave. At a wondrous seven minutes, it’s less broad than some of their other shorts but maintains an aura of magic that is their trademark. 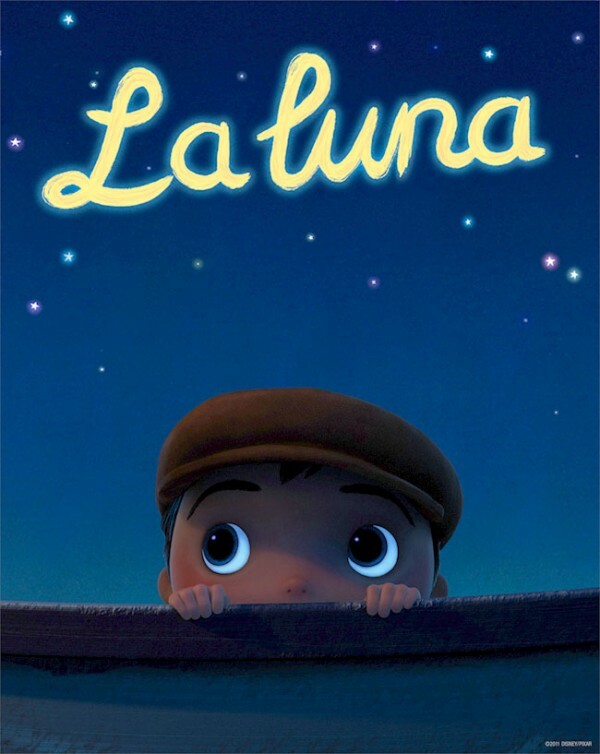 Described as “A fable of a young boy who is coming of age in the most peculiar of circumstances as he discovers his family’s most unusual line of work”, La Luna has a lovely twist concerning generational traditions that is a wonderful complement to Brave’s mother/daughter angle.